We have an experienced team of specialist accident at work solicitors waiting to help you claim the maximum amount of injury at work compensation you deserve. Injuries and accidents at work are very common and can occur in any job, in any situation. 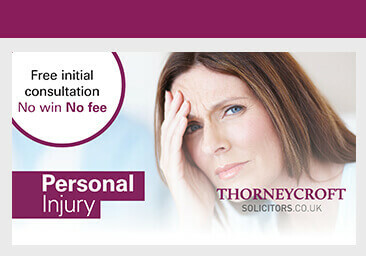 Thorneycroft Solicitors has a dedicated personal injury team that deals with all types of workplace related injuries and compensation claims. Employers have a duty to comply with Health and Safety laws and regulations and provide their employees with a safe workplace and if they don’t fulfil this duty then they are breaking the law, as well as putting you at risk. If you have an accident at work that was not your fault then you have a right to file an injury at work claim against them. To make a successful accident at work claim, you would need to prove that your workplace injuries were caused as a result of the negligence of your employer and we will advise you on what procedures you need to follow, as well as assisting you in obtaining evidence that will support your accident at work claim. Accidents can be embarrassing and stressful and we often blame ourselves when they happen but ask yourself this.. were you given the right tools and equipment for the job? Was the job risk assessed and properly supervised? were you given the proper training to do the job? are all the tools and machinery maintained and fit for purpose? If you are unsure if you are at fault or not then speak to one of our specialist solicitors who find out for you and will handle every aspect of your work accident compensation claim, providing the support and expertise you deserve.